Start looking for a digital nomad job. 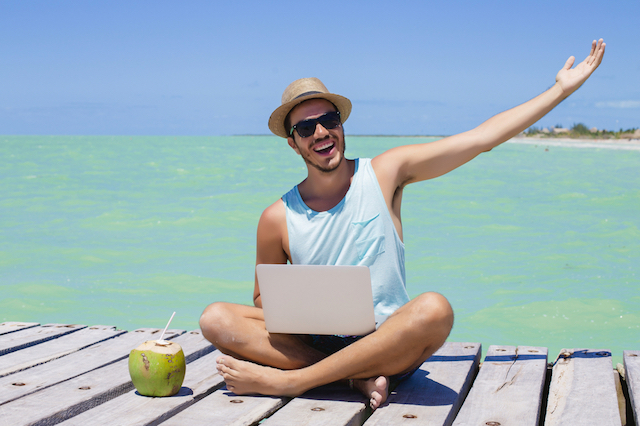 Are ready to find a digital nomad job? It’s great to see that you’ve clicked the link to view this page. It’s a positive sign to see that you are ready to take the next step to becoming a digital nomad. Several people want to be able to travel around the world while earning an income. In this post, I want to suggest the type of work that you can do to fulfil your dream of becoming a digital nomad. I will also provide resources that you can use so you can take the next step to becoming a digital nomad. Earn an income online as a writer. There are several companies that are looking for writers to produce content for them on a regular basis. By landing a few clients, you will be able to earn a steady income stream on a regular basis. You can use the following sites to find good-quality writing opportunities. Owned by professional blogger Darren Rose, this is one of the premium websites to find good copywriting and blogging jobs. People are prepared to pay industry rates and the quality of the clients tends to be higher as well. This site advertises jobs for journalists and PR specialists. There are several good paying writing jobs that are advertised, which can lead to regular work. You can sign-up on this platform and get writing jobs. Work in your own time and set your own rates. There are several writing jobs that get posted to this site on a regular basis. This company is on the lookout for writers that can create sales copy and interesting blogging articles. Earn an income doing IT work. If you have IT skills, there are several job opportunities available. It’s better to specialise in a field so you will be able to get regular work over the long-term. You can start finding opportunities to work remotely by visiting the sites below. Formerly known as The IT Job Board, IT developers and web specialists will find several lucrative opportunities on this platform. Most of the roles require an in-house presence, however, there may be some roles where the hiring company will consider remote workers. Similar to Dice, CW Jobs lists several technical specialist jobs that are both in-house and remote. This platform exposes freelancers to several businesses that are looking for skilled workers. The rates of pay can be as competitive as working in a full-time role. This is a job board for IT specialists such as developers and designers. There are many big brands who work with the talent on this platform. One thing to bear in mind is that they have a vigorous qualifying process to get listed on the platform. So make sure that you have the skills before applying. There are several web development and IT development jobs available on Stack Overflow. Simply conduct a search to find suitable roles. This platform is specifically for Ruby developers. This US-based IT job platform lists several development jobs. There are also some design jobs available on the platform. There are several IT projects that you can apply for. However you will need to negotiate rates of pay that match your skillset. There are several jobs presented on this platform as well. There appears to be a large amount of technical jobs, however there also appears to be marketing and writing jobs available on this platform. This platform is specifically for designers. There are jobs based all around the world. However you can discuss the opportunity to work remotely with the employer that is advertising the role. If you are bilingual, you can join this forum and apply for translation job opportunities. Another job website for translators. Other sites that you can use to find digital nomad jobs. If you want to get the ball rolling with your career as a digital nomad, you can use the following links to find opportunities that will allow you to earn an income online. There are several jobs that pop-up on Gumtree UK, however, many employers tend to favour UK citizens. There are opportunities to find remote work. However you will need to keep on checking their website from time to time. Gumtree Australia typically has a few remote job opportunities available. In some cases, you can pitch for an in-house role and ask if they would consider working with you remotely. Upwork has several freelance jobs available and is a great way to get your freelance career started. Something to bear in mind is their fee rate (which will set you back 20% of what you earn), and you will also need to account for the amount of tax that you will need to pay in your country of residence. You can check out this handy guide from Location Rebel, which shows you how to get clients on Upwork. As the name says, Freelancer.com provides several freelance job opportunities. However, the platform forces freelancers to compete with people from developing countries from India, Bangladesh or Pakistan. However, you can still find a pool of clients that you can work with. This Australian jobseekers website lists remote job opportunities from time to time. The jobs are usually listed as casual work. Use its search platform to find businesses that are hiring remote workers. You can find work on Fiverr.com by setting up an account and publishing jobs that you can do with a starting price of $5 USD. The platform allows you to upsell and set tiered prices so that you can earn more from your clients. I’ve even published a guide that shows exactly how you can build your copywriting business as a freelancer on Fiverr. You can use this freelancer website to find active jobs in admin & support, marketing, web design & development, writing, management and more. This site aggregates jobs from around the web. It can be handy when looking for remote work opportunities in your industry. Primarily based in the UK, US and Europe, there are several job opportunities that you can look for on their platform. Totaljobs shares thousands of jobs on their platform every month. Simply log on and search for remote-working opportunities that will suit you. People from this subreddit community share links to digital nomad jobs on the web. Many of the jobs are IT-centric, however, other remote jobs do pop-up as well. This site shares a range of jobs such as IT, web design, copywriting and customer support. This site shares several jobs such as account management, marketing, accounting, creativity and more. The jobs selection isn’t only restricted to digital jobs as well. Working Nomads is a job aggregation site. There aren’t heaps of jobs on this platform, but you might find an opportunity that suits your skillset. This site is specifically for people looking to work remotely. There are several job categories that the site offers such as data entry, consulting, recruitment, business development and more. This European-based job website helps digital nomads find remote working opportunities that pay in Euros. The only thing is the jobs are IT and marketing specific. This is an international job board where you can find potential employers who may consider remote working opportunities. You can use this job board to find job opportunities in customer support, programming, design, copywriting, marketing and management. Find jobs in marketing, tech, writing, project management, support and more. This US-based website lists several job opportunities across different working sectors. There are too many to list here, so it is best to visit the site and see if there is a role that suits your skillset. This site provides several job opportunities at different experience levels. If you have been working professionally, then you might want to consider looking for remote working opportunities through this website. There are thousands of job opportunities available on LinkedIn. The job market is catered for working professionals. There are a few roles that allow you to work from home or remotely. However most of these opportunities will need to be negotiated with the employer. You can find some freelance opportunities on this website. However it doesn’t have as many jobs as the other sites. You can find job opportunities across several sectors. However there isn’t an abundance of jobs on the site. There are several freelance jobs that are posted to this site. However you will need to find opportunities that don’t require a physical presence. This site is designed to help digital nomads. However it lists few job opportunities. That being said, you can apply for the roles to try to get online work.